It is important to know that we do have American bittersweet (Celastrus scandens). It has more elliptical shaped leaves, rather than the rounded of the Oriental bittersweet. American bittersweet can also be distinguished from Oriental bittersweet by its leaves when they are just beginning to emerge from the bud. Oriental bittersweet leaves are folded flat along the mid-vein, whereas American bittersweet leaves curl along the edges toward the mid-vien and resemble a rolled up scroll. The fruit of the native vine appear as single clumps at the tips of the branches, compared to fruit of the non-native vine appearing up and down the stem. To add to the possible confusion,the two different species in the same genus (Celastrus) are crossing and producing plants that sometimes have characteristics of both the native and non-native species. Yikes! 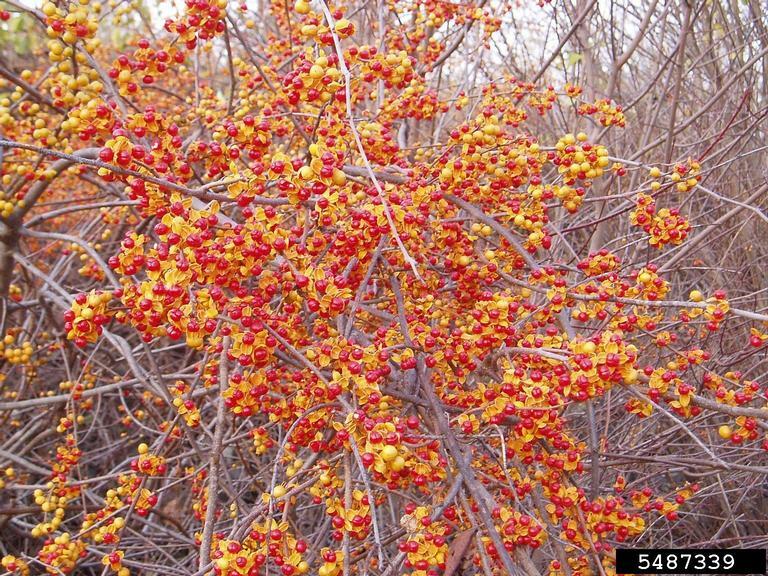 Because it is National Invasive Species Awareness Week, we will be focusing on oriental bittersweet in the remainder of this alert. Oriental bittersweet is invasive vine that is native to China, Japan and Korea. It was introduced to the United States as an ornamental plant around 1860. This deciduous, woody, twining vine can climb on trees, shrubs and anything else in its way. The leaves are alternate, glossy and finely toothed. They are usually rounded, but there can be variation in the leaf shape. Stems are light brown with white pith. Roots are bright orange in color. The flowers of this vine are greenish and have five petals. Male and female flowers usually occur on two separate plants, and bloom time occurs in May - June. The plant is well-known for its bright fruits. Stems and red and orange fruits are cut in the fall and commonly used a natural decorations which can lead to plant "popping-up" in new locations. This very aggressive vine will grow over everything in its way. When it is climbing upward, this vine tightly twists itself around other vegetation girdling its support system.